i am yarning along - decreasing and about to begin the neck/hood portion of the sweater! hooray! i only hope there may be one day colden will actually need to wear it yet. maybe when we visit chicago? it is positively springy around here. i ordered the above book in the mail, and it arrived at my house ripped! through the binding and all the way through the first chapters. bleah! 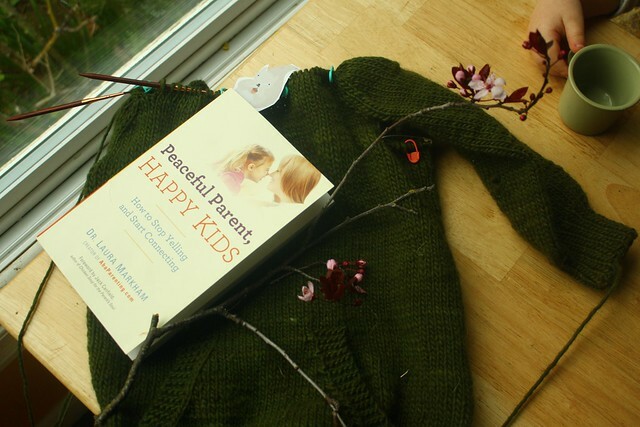 i have been avoiding parenting books for awhile, but i have not been avoiding yelling, so i thought i would give it a go... unfortunately, i found myself feeling not-so-peaceful upon receipt of damaged goods. *deep breath* i decided to return it for a shiny new one, but i'm reading it until the new one arrives. i am confident the contents will prove more rewarding than the superficial appearance, right?